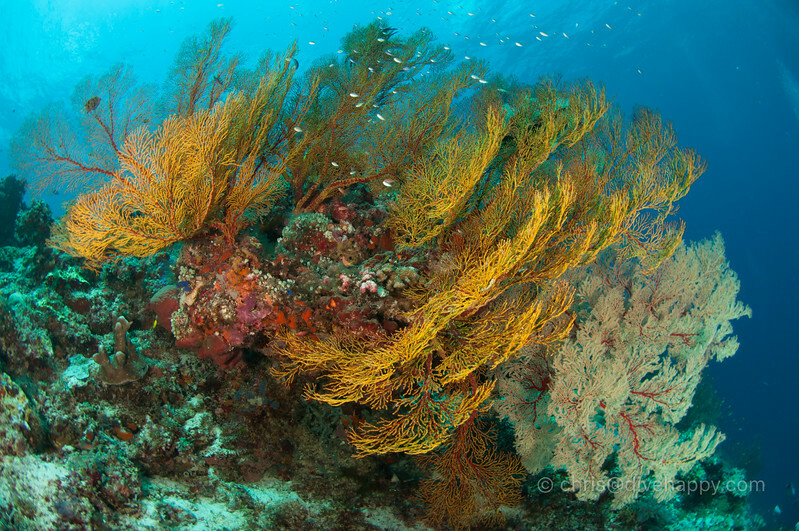 What’s special about Tubbataha Reef? Why would you go there for diving? Imagine jumping in the water and finding yourself staring down the side of a mountain. The twin atolls of Tubbataha have huge slopes and vertical walls twinned with often 30 metre plus visibility, giving you the feeling of flying next to an aquatic Everest. From the shallows to the depths, Tubbataha is carpeted with corals and, given its remote location in the middle of the Sulu sea, it’s a place of shelter and a hunting ground for a lot of the Big Stuff that lives in this part of the ocean. There are currents which make for exhilarating drift dives, but you have to watch your depth and pay attention to possible down currents and washing machines. Tubbataha is more than just the Philippines’ finest diving destination – it’s an important part of the country’s national heritage. Tubbataha was designated a UNESCO World Heritage site in 1993 and is also featured on the 1000 Philippine peso banknote. What Can I Expect To See At Tubbataha Reef? Tubbataha attracts some of the biggest marine megafauna – whale sharks, manta rays and sharks. There are hundreds if not thousands of grey reef sharks at Tubbataha, seen on virtually every dive, and out in the blue, usually at depth, hammerheads and tiger sharks are often spotted, if only for a few fleeting seconds. Similarly, whale sharks and mantas are not a dead cert – but there’s a solid chance of getting lucky. 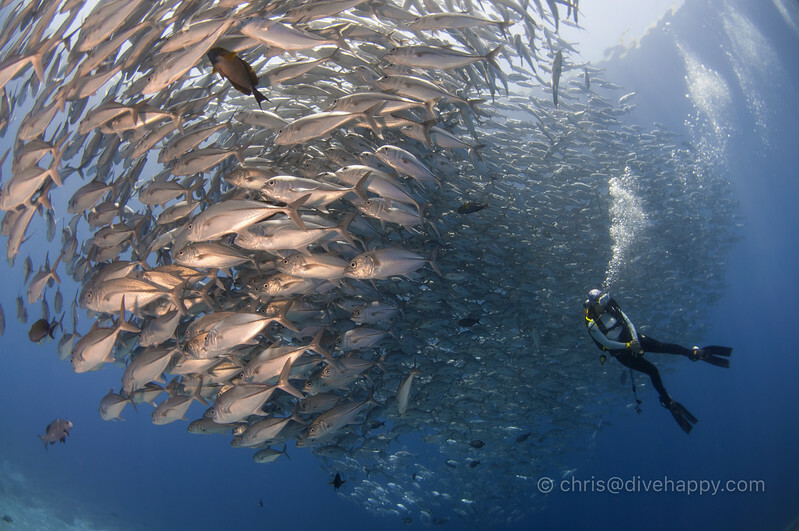 Besides the big guys, Tubbataha also has spectacular schools of fish like jacks and barracuda, thousands strong, and a never-ending carpet of coral stretching out both horizontally and vertically along the atolls themselves. 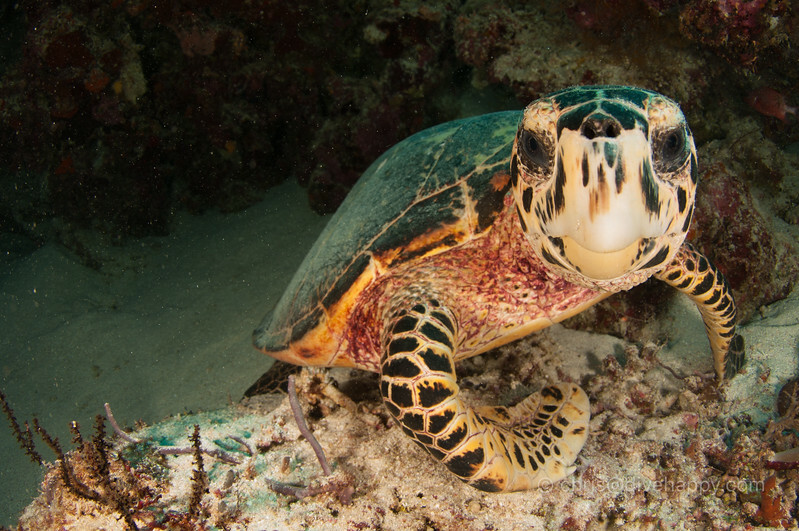 Turtles are also very common in Tubbataha, and they usually tolerate divers well. Get in the water, go with the current and drift along the wall to see what you can see – the sheer size and scale of the atolls means every dive is epic even when your luck’s not in on the megafauna front. Going on a liveaboard is the only way to reach Tubbataha Reef. The two atolls are completely uninhabited, except for a small ranger station. How to get to Tubbataha Reef? From Manila it’s a one hour flight to Puerto Princess, the capital city of Palawan island from which Tubbataha liveaboard depart. Numerous Filipino airlines fly to Puerto, including Cebu Pacific and Philippines Airlines. Check Skyscanner for flight times and details. Usually you’ll fly in early afternoon, be met by your liveaboard crew and taken straight to the boat. Peurto Princesa is an interesting town to wander around for a few hours if you have time with a few decent coffee shops etc – the harbour is within walking distance of the city centre, or a short ride in a trike (the 3 wheeled motorbike / sidecar that is ubiquitous in Puerto). Puerto Princess is also the gateway to Palawan, which is famous for the wreck diving at Coron in the north and lots of non-diving tourist activities too – the Ed Nido area, beautiful beaches like Honda Bay, the limestone cliffs of the Calamian Islands and the underground river. So you may want to add a few days before or after your Tubbataha liveaboard to also explore Palawan or go to the Coron wrecks. There are numerous hotels in and around Puerto Princess for all budgets – see Booking.com to check pricing, availability and previous guests’ reviews. 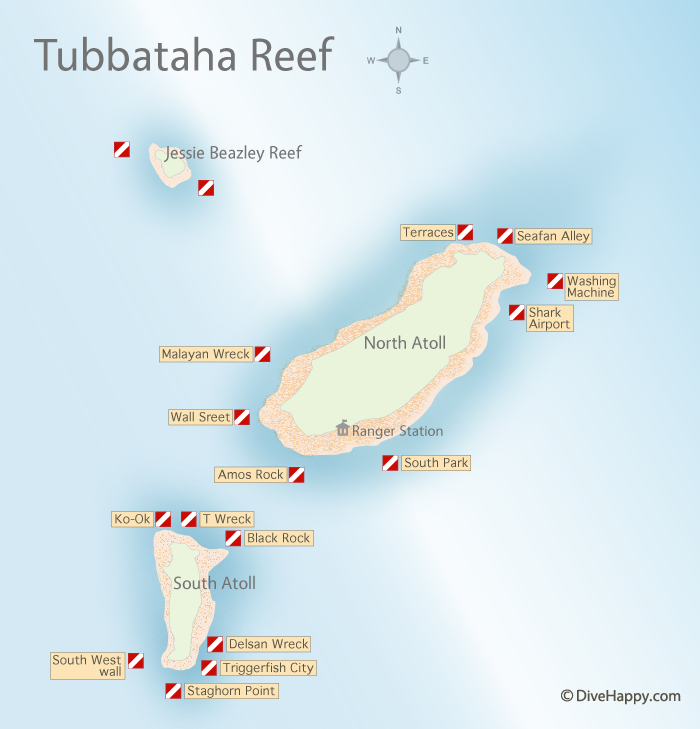 What are the stand out dive sites at Tubbataha Reef? Delsan Wreck, Shark Airport, Black Rock and Malaya Wreck are all perennial favourites and will feature heavily in any Tubbataha liveaboard itinerary. Jesse Beazley reef, which is located just off Tubbataha Reef, is usually visited at the end of a trip as the boat starts to head for home. How much time should I spend in Tubbataha Reef? Most trips to Tubbataha last 5 days – embark the evening before, sail overnight, dive first thing the following morning – repeat for 4 days and then dive on the fifth day depending on what time your flight departs the following day. With the arrival and departure day, it would be 7 days in total (i.e. 2 days travel, 5 days on the liveaboard). Where is Tubbataha Reef located in the Philippines? Tubbataha Reef is located in the middle of the Sulu Sea, 171 km directly south of Palawan island in the Philippines. 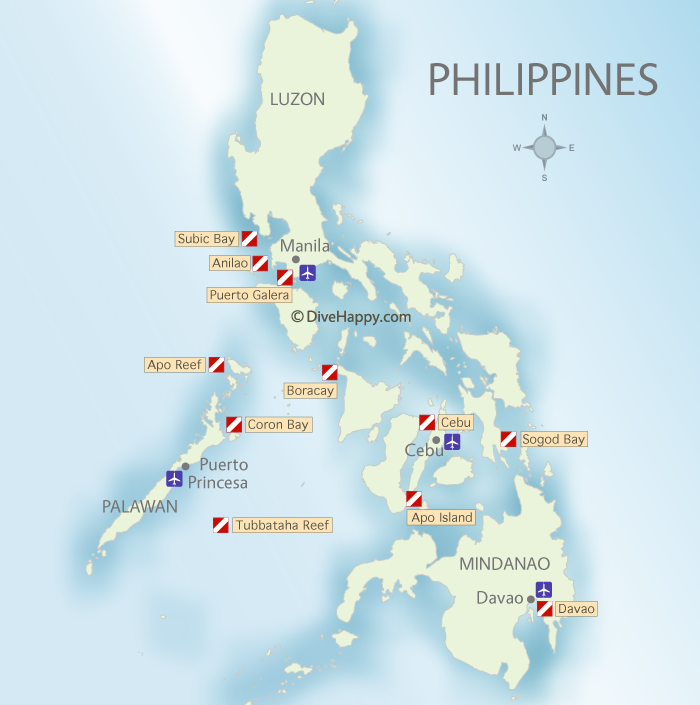 What dive insurance do I need for the Philippines? World Nomads provide travel insurance if you’re travelling in the Philippines that covers you both on land during travels to and from your liveaboard and also while diving. Their insurance policy provides coverage for certified divers who don’t go below 40 meters and are diving with qualified guides or instructors. You can purchase insurance coverage on a per trip basis and extend it easily online if you decide to keep travelling. World Nomads are recommended by Lonely Planet and National Geographic among others. Diving insurance is mandatory at Tubbataha Reef and proof of purchase needs to be shown along with certification cards and log books. Get an insurance quote now. Where To Stay Before And After A Tubbataha Liveaboard? You can usually get a flight in and out of Puerto Princesa before and after a liveaboard without having to stay overnight in the city. There are numerous hotels to choose from in Puerto Princesa if you’d prefer to rest before flying on or exploring Palawan island. When to dive Tubbataha Reef? When’s the best time of year? Tubbataha Reef is only accessible from March to June each year. As such, demand is high for the handful of liveaboards that go there. You can check pricing and availability for Tubbataha live boards either this season or next season. Is Tubbataha Reef safe for travelers? Yes. It’s worth remembering Tubbataha Reef is a remote location with no medical facilities – the nearest hospital is back on the mainland at Puerto Princesa. The nearest hyperbaric chamber is in Cebu City ie a long way away. You must ensure you dive safely and well within your limits. 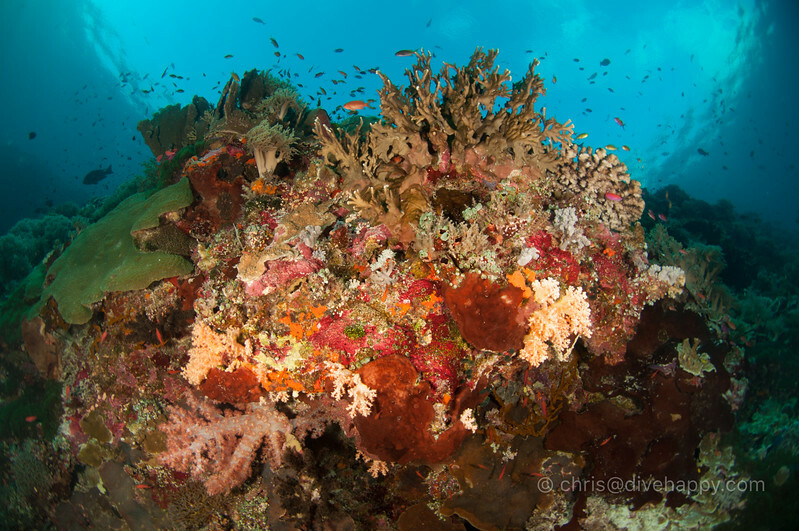 What should I pack for a dive trip to Tubbataha Reef? See the Divehappy Liveaboard Packing List to help you remember to bring everything you need. 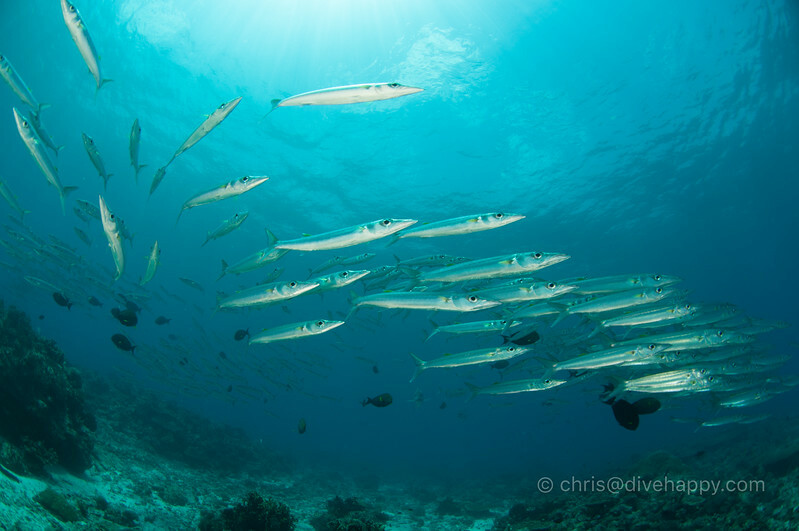 What topside things are there to do at Tubbataha Reef? The main thing would be visiting the Tubbatha Reef ranger station, where the rangers live for 2 months at a time and run patrols 24/7 to protect the atolls. They are always very happy to see visitors as it’s a tough posting. You can buy tshirts and other souvenirs at the station which help fund it. Tubbataha is also a bird sanctuary so it’s great for bird-watching. Back on the mainland, the island of Palawan has numerous tourist attractions as mentioned above. 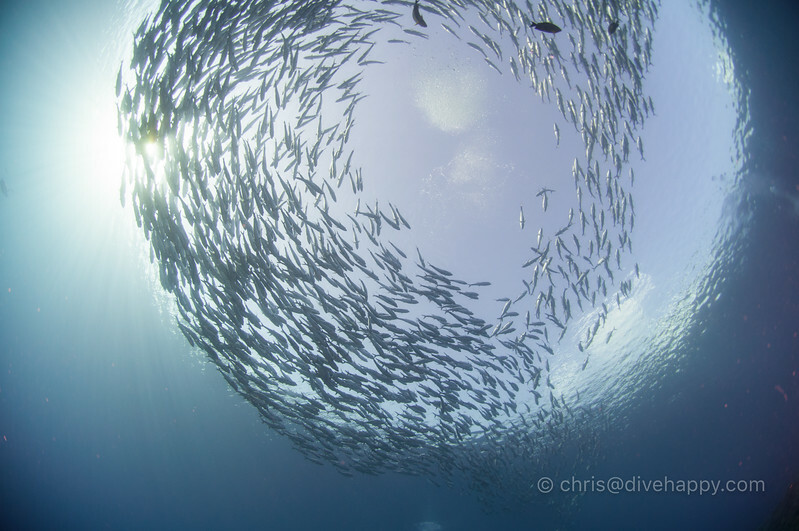 Listen to the Divehappy podcast about Tubbataha Reef with Yvette Lee, veteran of the Philippines dive industry and Marketing Director for Discovery Fleet who have two liveaboards operating at Tubbataha. 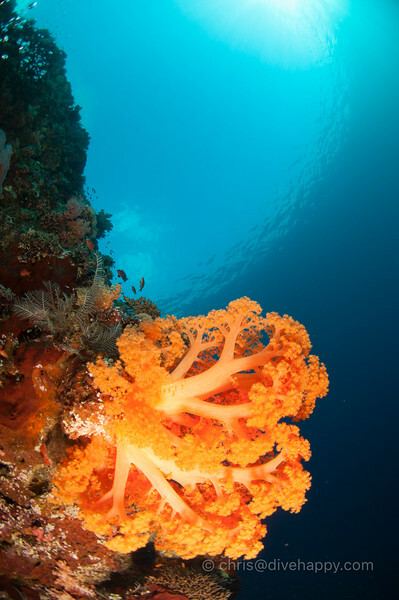 The official site of Tubbataha Reef is well worth a look for the latest news about Tubbataha and to understand the complexity of conserving and protecting the reefs. Thanks to Discovery Fleet for inviting me on the Discovery Adventure liveaboard on my most recent trip.